CD speed gauge is puzzling me. If we take the proposed speed : 706 x 1024 / 4 = 180736 B/s -> 180736 / 75 = 2409,8133... bytes per sector? Even trying to calculate sector sizes for neighboring values of 705 and 707 KB/s (just to rule out rounding), I end up with possible sector sizes between 2406 and 2413, and I couldn't find any references for anything in that range. So, the data rates DO match 4x, but ImgBurn calls them 3.5x. Why is this and where does the "706 KB/s = 4x" figure come from? There's an old issue with the cd speeds (just the translation into '???x'). It was fixed at the time of the report, but that fix isn't present in any 'released' versions of the program. The value in the log comes from the drive itself. Different drives report different values. 176 is frequently used for 1x CD speed... but then so is 150. Google the 2 values (along with the term 'cd speed') and maybe you'll find the answer?! Now it doesn't matter what the actual user data sector size is. could this be what's happening under the hood? Also, it seems that the log always gives data rates matched to mode2 sector size, whether you are burning mode1 or mode2. I don't recall the value that was being used for the conversion to an 'x' rating in 2.5.8.0. My only hope is that the one it's using now works correctly! Specifically, the 'effective write speed' log entry takes the value from the drive. It queries it to find the current write speed and displays it 'as is' in the log. The value is in KB/s according to the MMC specs. I then do my best to guess at the 'x' speed it relates to... but I don't really know if it's using 1000 as a KB or 1024 as a KB. As I say, different drives do different things. W 16:39:25 The drive only supports writing these discs at 16x; 32x; 40x; 48x. But when it comes to MEASURING, things go strange. The last 3 steps could be replaced by a single step: division by 1x speed in B/s for current data mode. 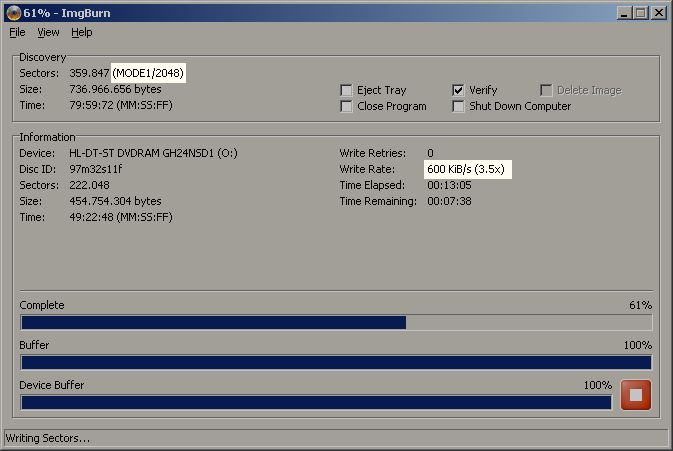 The program uses the Mode 1 / 150KB/s speed for its CD speed calculations. For transfer rate 'x' values, the appropriate 1x speed is *calculated* rather than *picked* from a list - where the list would have to cover 2048, 2332, 2336, 2352 and 2448 sector sizes. So it's a calculation rather than 'switch / case' or 'if' statements. Right or wrong, that's just the way I've done it. I think it must be the '150' in the above calculation that is using a different constant/value in v2.5.8.0. Sorry, I didn't intend to annoy or critizise you, I was just trying to figure out what was happening. I presented what I found out while trying to come up with a process that would give the same results as I was getting. Didn't intend to impose my method or anything. I guess tend to sound rather imposing, so I apologize for that. So, the formula is "KiB/s / (150 / (2048 / MODE#)) = #X"? 2451 / (150 / (2048 / 2048)) = 16.34 this would be the correct answer, but doesn't seem to match what the program spits out. 2451 / (150 / (2048 / 2352)) = 14,228027210884353741496598639456 does match indeed. 691 / (176 / (2048 / 2352 )) = 3,4186765615337043908472479901051 seems to match much better, but not quite. ah yes, that's much better. So, it seems that, in the end, there is, indeed, some strange action here with mismatched sector sizes. Anyway, thank you for taking your time and bearing with me. And for making ImgBurn, of course! That's the formula as it currently stands in the unreleased version.